Just got this scene I painted from the central piazza in Ravello photographed and wanted to share it. It was such a glorious morning when we were painting, with the clouds partially obscuring the mountain tops, and that wonderful umbrella tree, I just couldn’t help myself. 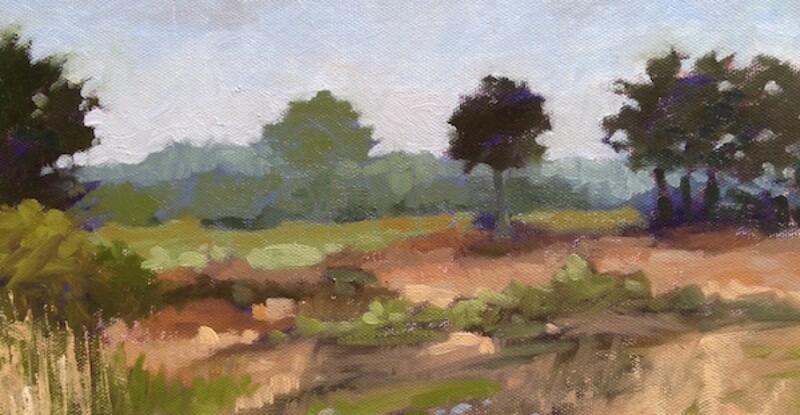 It’s a small 12×9 oil but I just had to paint it that morning! This painting was done in Ravello at the entrance to Ruffolo Gardens. We painted there a lot during the workshop and was an incredibly beautiful spot. The little pathway on the left next to the entrance was a very steep incline going down to a church were we had tickets for a piano concert. The only problem was that we had to walk back up, and was definitely a killer walk (think 45 degree angle or at least if felt like it)! This painting was made on a beautiful morning in the main piazza in Ravello. It was empty when I painted it but by noon the place was packed. Very fun place to paint. This was painted in Ruffolo Gardens in Ravello. The arbor was a very quite part of the garden to paint and was a bit of relief from the other areas where tourist swarmed the gardens in the afternoon. It had an incredible view of the Mediterranean Sea. This is really a beach picture in Positano. The beach was directly behind me when I painted this. I loved the colorful building and although it was by the beach the people where rather well dressed considering it location. Every day is laundry day in Italy. I painted this from the steps of our hotel because I was afraid of getting killed if I went by the road. The streets are so narrow and not much room for plein air painters. I just had to capture the laundry being hung our in the beautiful light of the Amalfi Coast.